Smeaton is a rural township 12 km north-east of Creswick and 105 km north-west of Melbourne. About 6 km north of the township is Smeaton Hill (676 m), the name of a pastoral run taken up by John Hepburn in 1838. Hepburn was one of the first overlanders to take livestock to Port Phillip, following the Major's line (the dray tracks made by the surveying party of the New South Wales Surveyor-General, Thomas Mitchell, in 1836). Smeaton was the name of an estate in East Lothian, Scotland, owned by a relative, Sir Thomas Hepburn. Smeaton Hill is also named Mount Kooroocheang, and there is a road to its summit. Hepburn built a water powered flourmill in the 1840s south of his homestead, near Hepburn Lagoon, Kingston. This early structure provoked the building of a larger complex in Smeaton township when a subsequent owner of Hepburn's mill underpaid farmers for grain. The Smeaton mill was a large producer until wheat farming moved to the Wimmera area, but continued for several decades until 1957. With the decline of the mining economy, the commercial actiivity in the township slackened. The local agricultural society moved its showground to Kingston in 1922. Some buildings from the more active era survive, however, particularly the flourmill complex, the rebuilt school (1902), the Presbyterian church and former bank buildings. 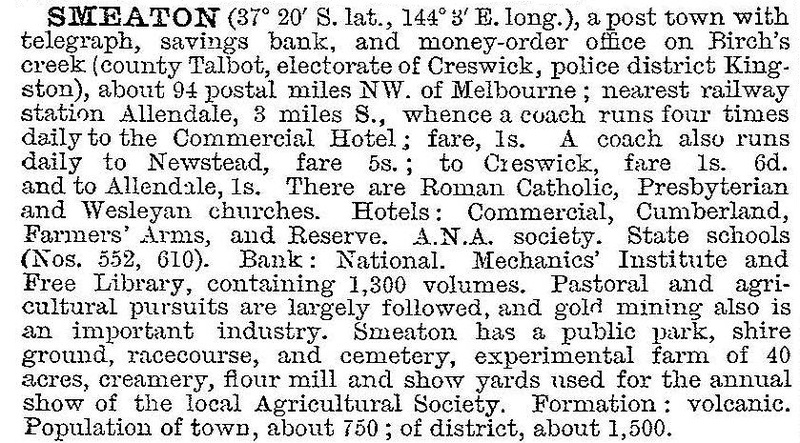 Smeaton has a public hall, a recreational hall, a hotel, a general store, a Presbyterian church, a recreation reserve, a bowling club and tennis courts. The primary school had 12 pupils in 2013 and closed at the end of that year. Attractions include the flourmill complex, restored for self-guided tours, and the Tuki trout farm. The former is on the Australian and Victorian historic buildings registers, as are Hepburn's homestead and family cemetery. The district's farming is mixed pastoral and cereals. Plans for a 19-turbine wind farm in Smeaton were abandoned in 2010.